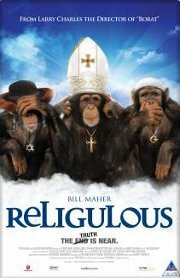 Comedian Bill Maher teams up with the director of Borat to take a look at religion around the world. Focusing mainly on religions familiar to western audiences, he interviews assorted believers, asking them difficult questions about what they believe and why. Naturally the interviewees do end up looking rather silly, as Bill inserts subtitles and video clips in the editing room to express his opinion on their views. No persons under 18 (Language, Prejudice, Blasphemy). Oh look, there's Gabriel again!